Minimalist and contemporary in design, an AEG will blend into any style kitchen and look elegant. An AEG dishwasher will provide you with state of the art performance to produce the best cleaning results. 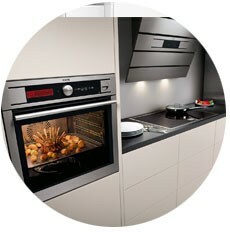 Look out for their MaxiClasse range providing additional internal space than previous models. Nothing but innovative functions to give you the best food preservation possible. Stylish Cooker Hoods each with a bold design statement, creating maximum visual impact. AEG fridges come in a variety of sizes to suit every kitchen design. All of our AEG Microwave Ovens are designed to be built-in to your kitchen cabinets. A range of freestanding, built-in and built under to accommodate all your needs. Combines style with all the latest technology to provide perfect results every wash.
Not seen the category you're looking for? Browse our entire AEG range here. Passionate Perfectionists - AEG want everything to be exactly right - and so you can expect nothing less from your appliances. Focused on enjoyment and passion for cooking - AEG create products that will enhance your experience, every time you use them. Chosen by Professional Chefs - Combining design with outstanding cooking performance AEG is the perfect solution for creative chefs. Top Quality Materials - High-value materials are used, but the number of different materials is kept to a minimum for purity and consistency. Style is Never an Accident - For over a hundred years AEG have been using cutting edge designers to help create and develop their products. Don't just take our word for it... Consumer champions Which? has included AEG in the shortlist for the 'Best Home Appliance Brand' category for this year's awards. Which? recognises businesses that have achieved positive change and that delivery excellent products that can survive their rigourous testing and come out best in class. Which? are a coveted symbol of product excellence and they have selected AEG as a leader in the industry, so you can be sure to receive a great product if you make an AEG purchase with us.